I'm getting ready to launch two more books for my Draconia series. 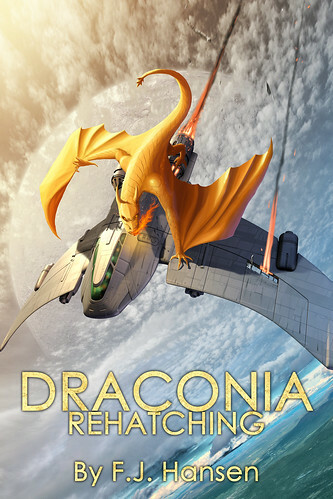 Draconia: a world home to a race of intelligent dragons--the Draconians. Hatching: a Human colony established on Draconia for a 10-year trial period. During this time Draconians and Humans would learn to trust each other and form a peaceful co-existence. In exchange, the Earth Union would protect the planet from invaders. The Earth Union has become lax in upholding their end of the Treaty. Loyal Providence, Humans who oppose the Treaty, and Commander Slikmac of the lizard-like Norseen, who seeks to control the Draconians, have formed an alliance. Together, they launch a devastating attack on Draconia, provoking a renegade group of Draconians into attacking the colony. Varthikes and Audwin race to repair the fracture in their dream of a peaceful co-existence, battling invading Norseen, enduring the brand of traitor from both sides, and tests to their friendship. Ebook now available now for pre-ordering from Apple, Barnes and Noble, and Kobo. It will launch December 15, 2014. The Treaty between Draconia and the Earth Union was in shreds. The experimental colony of Hatching, a product of that Treaty, was to be removed from Draconia. Varthikes and Audwin's dream of a peaceful co-existence between their two kinds seemed lost. Forces from Earth were closing in to avenge what was believed to have been an unprovoked attack on the colony. Norseen forces were also closing. Renegade Draconians still remained to ensure all aliens are repelled from their world. Enemies were everywhere. Hope still existed, however. Captain Mark Johnson of the United Earth Space Fleet is determined to defend Draconia against all threats--Norseen and Human. Malcon Ambassador Cairleeta has devised a plan to save Draconia and the colony. But, ultimately, it is up to Varthikes and Audwin, and the power of their friendship, to ensure their home survives the Norseen invasion to be rehatched. Ebook now available now for pre-ordering from Apple, Barnes and Noble, and Kobo (give it a day or two). It will launch on January 1, 2015. That fighter looks very similar to the F-302 in Stargate SG-1. I kind of does. But, this fighter has a longer body section. It's actually based on a Micro Machine fighter from Galoob's Galaxy Voyagers line. The forward-sweeping wings are a common design. Besides the F-302s and Death Gliders from Stargate, the Centauri fighters from Babylon 5 and the Son'a shuttles from Star Trek: Insurrection feature it. The location of the engines too. 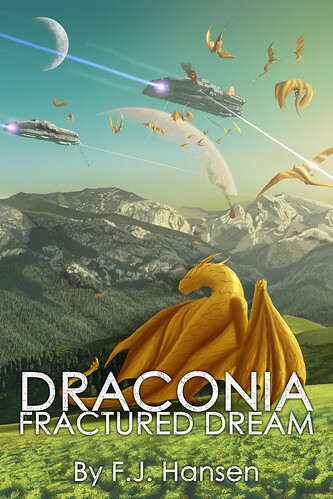 My second book, Draconia: Fractured Dream, is now available in all e-book formats.